My first view of Kuala Lumpur, getting of the train! Kuala Lumpur is one of the most interesting cities I’ve visited, it’s a mix of religions, cultures, languages, architecture and of course, art! You can find hindu temples, mosques and churches right next to each other, the most luxurious mall you can think of right next to a street food vender, shiny tall buildings and tiny old houses, Kuala Lumpur is contrast city! It’s very easy to get around, the subway is reliable and modern and most importantly, cheap. I took the express train from the airport and was at the Central Station (KL Sentral) in a very short ride. Keep the ticket when you get through to the express train, you’re going to need it getting out, the same goes with the subway. From KL Sentral you can take the subway all over the city. It’s also from here that the trains taking you to other parts of Malaysia and even Thailand depart from. 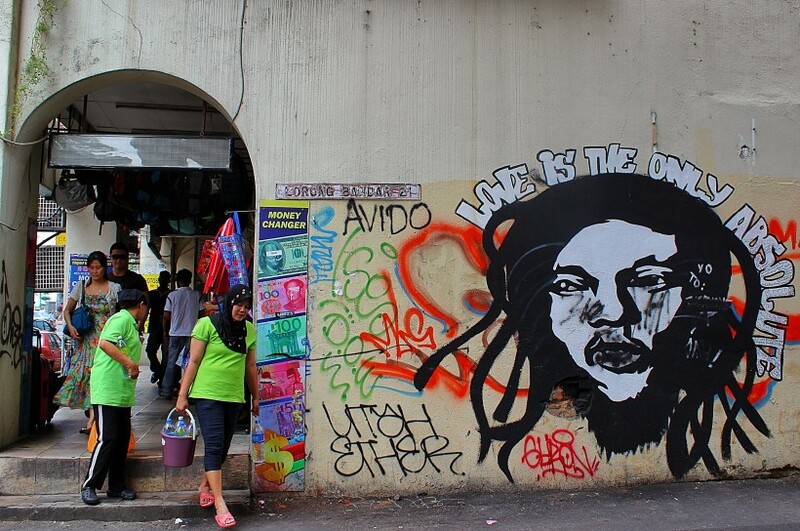 I took the subway to the area around the canal (China Town), station Pasar Seni, from there I just walked everywhere. It’s very easy to find hostels here and cheap, and there’s WiFi everywhere, if you get lost, you can always ask your smartphone! Just by the canal a great public space take over has been done, there’s so much to see my head exploded! Kuala Lumpur, February 2014. Colors on a wall, stuff of dreams! Kuala Lumpur, February, 2014. I can totally recommend street food in KL, there’s such a great mix of cultures here and it reflects on the food! You can eat for just a couple of US Dollars and try a lot of different small dishes. Around dinnertime, 5 – 6 pm, your going to see pop up cafes on the streets, buy small dishes from different vendors and enjoy. Maybe even top up your meal with some yummy fresh fruit for dessert! 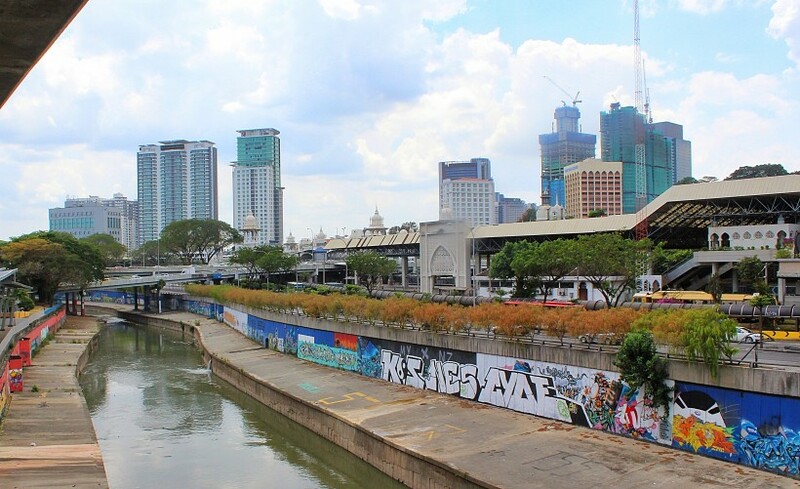 If you’re in a shopping mood and don’t want to spend a fortune at the luxury malls uptown, check out the flea market at Petaling Street or the KL Central Market right by the river at Jalan Hang Kasturi Street. Wow was pretty much the only word on mind when I found this! Kuala Lumpur, February 2014. 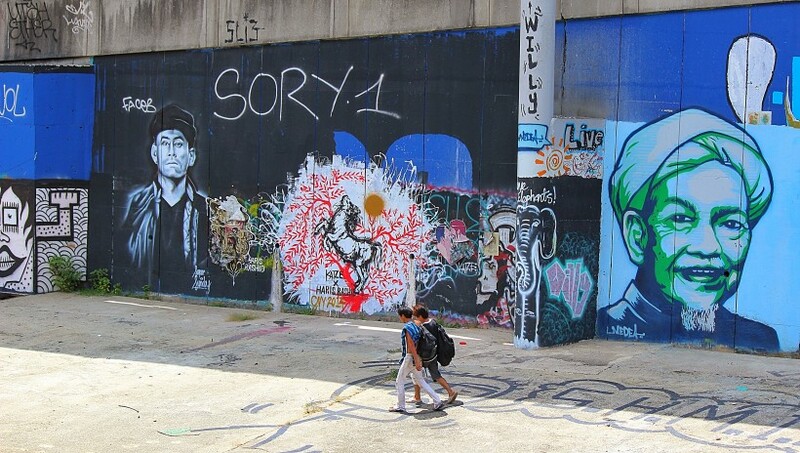 This entry was posted in Malaysia and tagged all you see is crime in the city, graffiti, kuala lumpur, malaysia, penang, public space take over, street art, tags, throws. Bookmark the permalink.